Hello and Welcome at the website of Sparkling Pride. We are Gerard and Els Vonk, we live in Leerdam in the Netherlands. In 1992 we bought our first dog, a English Staffordshire Terrier. With our Staffords we went to show and we have some litters of them. With proud we can mention that one of our puppies became Dutch Champion. 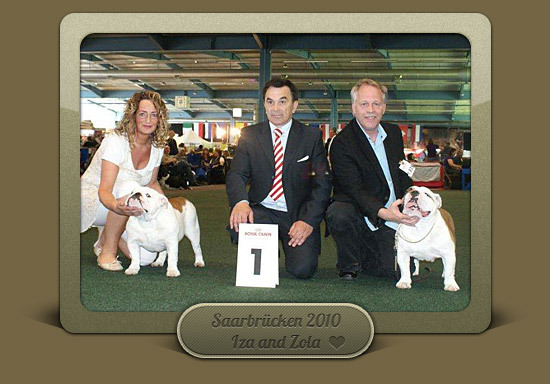 Our love for the English Bulldog was always there. We bought a bulldog female; Fashion. And she is our 'Sparkling Pride', a very sweet girl with a lovely character and great show qualities. At here first show at the Winner Amsterdam she get the first place in the open class females. A result to be proud of! This is the start of our kennel.